Kentucky Speedway and Dale Earnhardt Jr. Donate Crosley Jukebox to Nationwide Children's Hospital Nationwide Children's Hospital welcomed the personalized Crosley jukebox Kentucky Speedway gifted to Dale Earnhardt Jr. in honor of his retirement and soon afterwards was donated to the hospital in the racer's name. The Crosley jukebox will be located in the Dale and Amy Earnhardt Activity Room on the hospital's Rehabilitation Unit. "I can't think of a better home for this custom Crosley jukebox than the Dale and Amy Earnhardt Activity Room at Nationwide Children's Hospital," said Mark Simendinger, general manager at Kentucky Speedway. "The care provided here on a daily basis is phenomenal and we are proud to help in this mission. Prior to officially presenting the jukebox to Nationwide Children's, the Kentucky Speedway team loaded the Crosley jukebox with 80 songs that were suggested and voted on by patients and patient families of the hospital, as well as Earnhardt Jr. and NASCAR fans, via the hospital's social media channels. "On behalf of the patients, families and staff here at Nationwide Children's Hospital, we are so grateful for this donation," said Niki Shafer, senior vice president, outreach, Nationwide Children's Hospital Foundation. "Music provides a wonderful way for patients and their families to express themselves and this unique gift will be a tremendous joy to many who are going through some significant challenges." 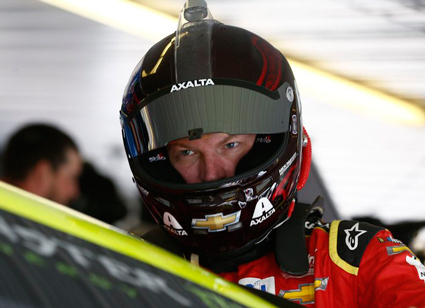 Earnhardt Jr. received the gift from Kentucky Speedway during the Quaker State 400 on July 8. Prior to the race, Patient Champions from the hospital were treated to a day of VIP experiences. Additionally, during race week, Earnhardt Jr. made his second visit to Nationwide Children's in just under three months, visiting patients on the hospital's Neonatal Intensive Care Unit (NICU) and Rehabilitation Unit. Earnhardt Jr. and his Hendrick Motorsports race team also participated in a kid-friendly press conference at the hospital. The jukebox is one of what has been several retirement gifts to Earnhardt Jr., who announced his retirement in April from the Monster Energy NASCAR Cup Series after the 2017 season. Crosley Brands awards its signature jukebox to each of the Kentucky Speedway race winners. Nationwide, the primary sponsor of Earnhardt's No. 88 Chevy SS, and a long-time benefactor of the hospital, dedicated one of the company's paint schemes to Nationwide Children's for the Quaker State 400. The logo and the hospital's signature butterflies adorned the racecar and Earnhardt Jr.'s race suit. Owned by Speedway Motorsports, Inc. (SMI), Kentucky Speedway is a 1.5-mile tri-oval racetrack located in Sparta, Kentucky just 35 miles south of Greater Cincinnati/Northern Kentucky. The track attracts fans from the Tri-State area of Kentucky, Ohio, Indiana and beyond. In its 17th season of racing, the speedway hosts NASCAR and ARCA events. In July, the venue presented the seventh running of the "Quaker State 400 presented by Advance Auto Parts" Monster Energy NASCAR Cup Series race. Prior to 2011, Kentucky Speedway hosted the NASCAR XFINITY Series races and the NASCAR Camping World Truck Series. In addition to the July event, the speedway hosts a second NASCAR XFINITY Series event in September along with an ARCA race. The venue also is home to many other special events throughout the year including concerts, driving schools, car shows, fitness runs and four driving schools. Crosley Radio has been a leader in the nostalgic electronics category producing old telephones, payphones, turntables, record players, headphones and other vintage inspired electronics. Crosley Brands also established Crosley Furniture in 2010. Today it's one of the leading furniture brands in the country selling indoor and outdoor furniture. Named to the Top 10 Honor Roll on U.S. News & World Report's 2017-18 list of "America's Best Children's Hospitals," Nationwide Children's Hospital is America's largest not-for-profit freestanding pediatric healthcare system providing wellness, preventive, diagnostic, treatment and rehabilitative care for infants, children and adolescents, as well as adult patients with congenital disease. Nationwide Children's has a staff of nearly 13,000 providing state-of-the-art pediatric care during more than 1.4 million patient visits annually. As home to the Department of Pediatrics of The Ohio State University College of Medicine, Nationwide Children's physicians train the next generation of pediatricians and pediatric specialists. The Research Institute at Nationwide Children's Hospital is one of the Top 10 National Institutes of Health-funded freestanding pediatric research facilities. More information is available at NationwideChildrens.org.